i Still write: There was no joy in Mudville that night.. There was no joy in Mudville that night..
Well, the season is officially over. The bats are being put away, the fields covered up for the winter. We turn our thoughts to spring and the season that may be. What will happen in the off season. What trades will be made. What new diamond in the rough will be found by the scouts to Ooohh and Awww us. Alas for me the Tigers have gone down in defeat after a stunning sweep of the Yankees. Only to have it returned by the Giants. I have ties to both teams, but a Tigers fan first. So I left with who brought me. So what I would like from you class is something baseball related. Something that says Summer is officially over and Fall is now upon us. For your work I have this. 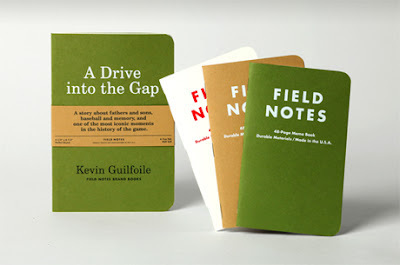 This little package (including the book) can no longer be had from the fine folks at Field Notes Brand. I have however ordered a few of these gems for this giveaway. So there ya have it. I will post anything you guys send in baseball related. Something special going out to Bean for the most unique card I've gotten to date.